The Ussuri Cat is a breed of naturally-occurring, semi-wild cats that originated in the banks of the river Amur in Russia. It is a cat with a wild look, a well-boned, athletic, and graceful body. The medium-size head is rounded, and the chin is well-shaped, though not prominent. The legs are strong and muscled, and are of medium length, while the feet are sturdy and somewhat rounded. They have a dark-tipped tapering tail, which is rounded at the tip. They are an extremely rare breed, and their population is not stable since they are being made to interbreed with the domestic cats. The Ussuri cat breed might disappear very soon if no breeding programs are conducted in order to preserve them. 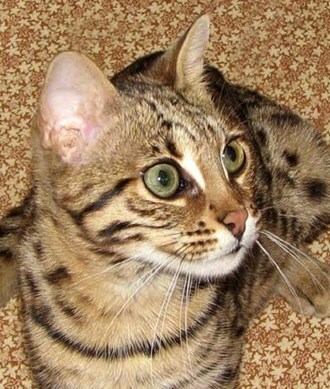 The history of the origination of the Ussuri cat is obscure, and not much is known about its development. The Ussuri cat is said to have developed by natural cross breeding between a breed of small wild cats called the ‘Amur Forest Cat’, and a subspecies of the Asian Leopard Cat, known as the ‘Amur Leopard Cat’. The Ussuris originated in the Amur River region in Russia. Another theory suggests that, Ussuris were born from the cross between a locally domesticated cat and the Amur Leopards (which is the cat that was used to develop the Bengal Cat). Later, the Ussuri cat was also made to breed with the Domestic Shorthair and the Siberian Cat. However, no official breeding program was initiated for the development of the Ussuris, as yet. This indicates that, these semi-wild felines will continue to remain as one of the rarest and relatively unknown cat breeds for the time being. In the mid 1990s, a translated breed standard for this breed had been published though, but since then, nothing was heard since then, and its breed status is yet unclear. The breed is rare even in its homeland. 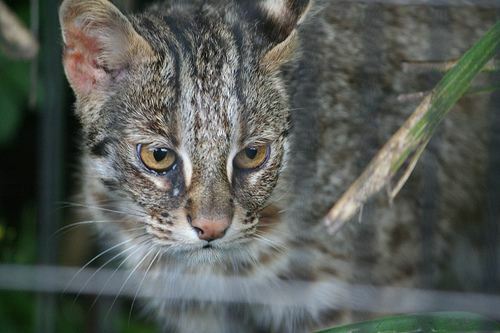 The Ussuri cat has not yet been recognized by the TICA, or the CFA. These are adroit cats that are marked by smartness and intelligence. Because of their inherent wildness, they have a natural talent in hunting. This virtue makes your house free of rats, mice, lizards, or any such intruders. However, they love being outdoors, and care should be taken so that their passion for staying outside doesn’t implore them to run after squirrels, chipmunks, or chameleons, and disappear in the wild. They are affectionate, and love its family members, however, they are one-man cats, and would make a strong bond with only one person in its family. However, they are not lap cats, but are rather playful. Though, they are not good for houses with very young children. These semi-wild feline is independent-natured, and is rather quite. They love attention but do not long for it like many other cat breeds. They will not follow you from room to room, meowing and begging for food or a cuddle. Vigorous grooming is not essential. They have a glossy, short, close-lying coat, with a thick undercoat, and shed seasonally. Only occasional brushing (twice or thrice a week) is enough. Ussuris are naturally healthy breeds, and are not prone to frequent health problems. General feline issue might appear though, however, no more than usual. But do not skip to fix an appointment with your vet annually. Give your Ussuri general cat foods like kibbles. However, do not compromise with the quality. Ussuris are not voracious eaters, and can play all day alone soon after they finish breakfast. Rarely, some individuals show lynx-like tufts on the tips of their ears, something which is often seen in some wild varieties. Published on August 2nd 2016 by Shiloh Nevada under Russian Cats. Article was last reviewed on 22nd April 2017.